Many contemporary fantasies fall flat. This one doesn't. It is rare that I get excited about contemporary fantasies, either on film or in published form. It’s not that I don’t like them. I really do but, as a general rule, they don’t ring true. There are some major exceptions – Portrait of Jenny and The Bishop’s Wife excel in both forms primarily due to the amazing stories crafted by Robert Nathan. I want to direct your attention to one of my favorite contemporary films, The Enchanted Cottage. I cannot recommend it highly enough. 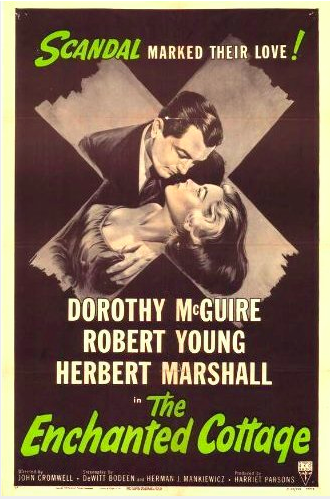 Based on the play by Sir Arthur Wing Pinero, the 1945 version is the second filmed adaptation following a silent version from 1924, which starred Richard Barthelmess and May McAvoy. In the 1945 version, we have an amazing cast including Dorothy McGuire as Laura Pennington, Robert Young as Oliver Bradford, Herbert Marshall as the blind pianist John Hillgrove, Mildred Natwick as Mrs. Minnett and Spring Byington as Oliver’s mother, Violet Price. In a quaint New England coastal town, Mrs. Minnett has a cottage for lease. The cottage has a reputation of being an enchanted place for honeymooners. Intent on leasing it are Oliver Bradford, an Army pilot, and his fiancée Beatrice (Hillary Brooke). Mrs. Minnett has engaged a local young unmarried woman, Laura Pennington, to be the maid for the young couple. The wedding is set for Monday, December 8, 1941. But before they can be married, Oliver is called up by the military and departs for the war, promising to return and marry Beatrice. He does return but not as the man he was before. He has been shot down and suffered some severe damage. His right arm is virtually useless and he has had nerve damage to his face. He is no longer the dashing young man he was before the war. He returns to the cottage to escape from his mother and his fiancé who have not dealt well with the changes. When he refuses to respond to them, they leave and Oliver is left alone in the house with the exception of Laura, the maid. Laura is homely and socially inept. She wears bad clothing that does not fit well and an awful hairstyle. Her makeup does not work. At a soldier’s canteen dance, every woman other woman is asked to dance except her. Love starved GI’s who have not seen a woman in months would rather sit a dance out than to be with her. Laura encounters Oliver about to kill himself and stops him. He asks her if she knows what it is like to be shunned based on looks, and when he looks at her, he knows that she does. He is embarrassed for asking the question. After stopping the suicide, she gradually draws him out with the help of John Hillgrove, a friend of Oliver’s brother. Since Hillgrove does not see him, Oliver relaxes around him. Eventually Oliver faces a crisis. His mother demands that he leave the cottage and come stay with her or she will come move in with him. Violet, as played by Spring Byington, is a clueless character who cares only for her own convenience. In a fit of panic, Oliver asks Laura to marry him. Laura has loved him for ages and wants to do this, but Oliver suddenly recants, thinking that this might be nothing more than a marriage of convenience to avoid his mother rather than one of love. The pair marry anyway and Oliver’s doubts do not disappear. The couple spend their wedding night in the cottage and Oliver balks at it all, feeling he has deceived her. Suddenly there is a feeling in the cottage of something changing. Oliver’s injuries and imperfections are gone; Laura is suddenly beautiful. The cottage is working its magic. The couple has never been happier. The film is sweet and rings true. It could easily be a maudlin mess but director John Cromwell, working with a script from DeWitt Bodeen with tweaks from Herman J. Mankiewicz, pull it off. The film was nominated for one Oscar for Best Original Score from the amazing Roy Webb. The score is wonderful and Webb apparently gave a performance of the suite at the Hollywood Bowl the year after the film’s release. Apparently, when the film was released, the critics considered it too manipulative of their emotions and savaged it while they late embraced The Best Years of Our Lives in 1946 for its honest portrayal of the war’s effects on veterans returning home damaged to their families. The TBYOOL is a great film. But I’ll take The Enchanted Cottage. IMDB indicates that a new version is due in 2016. Somehow I don’t think lightning will strike twice to make such a wonderful film. I hope they prove me wrong. Check it out when you get the chance.